Roma Stauffer Phillips was born on March 9, 1921 at home in Providence, Utah to Godfrey Stauffer and Rickey Leonhardt Stauffer. She was the youngest of eight children. 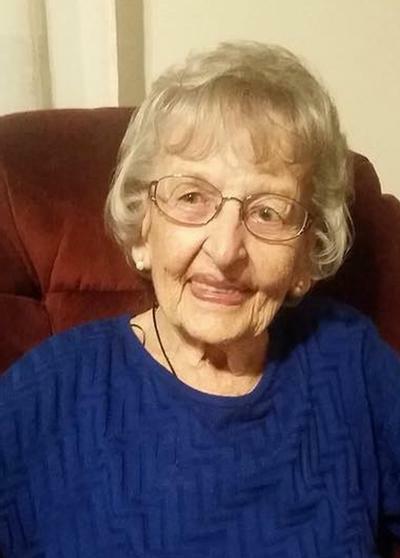 She passed away peacefully on the morning of August 11, 2018 in Montpelier, Idaho at the age of 97. She spent her childhood living on her parents’ small farm in Providence, Utah, where she enjoyed helping her parents with the many chores such as milking cows, feeding chickens, raising a large garden and preserving many types of fruit from their family orchard. She attended grade school in Providence and graduated from South Cache High School. She met her future husband, Harold W. Phillips at the Logana swimming pool in Logan. They were married on September 25, 1940 in the Logan Temple. Their first child, Harold Nolan Phillips, was born November 16, 1942, in Logan, Utah. In December of that year, Harold received a letter from Uncle Sam with “greetings,” telling him that he was inducted into the U.S. Army and required to report on January 4, 1943. During the time he was in the Army, Roma and Nolan lived with her parents in Providence. She was able to make some trips back east to visit Harold before he went overseas. Harold served as a medic in Patton’s Third Army until he was discharged in January of 1946. Their second child, Aralee Phillips (Sparks), was born February 5, 1947 in Logan, and the next fall they moved to Altamont, Utah where Harold began his teaching career. In the fall of 1949 they moved to Montpelier, Idaho where Harold began teaching at the high school. In January of 1951, they bought their home at 237 North 5th Street for $7500. It was originally built as a log cabin in 1890. Harold became principal of Montpelier High School in 1955 and their third child, Elizabeth Phillips (Lowe), was born November 28 of that year. Roma was a life-long active member of the Church of Jesus Christ of Latter-Day Saints and served in many callings such as Primary teacher, Dance Director and Drama Director with Harold, Primary president, Guide Patrol, Relief Society teacher, Nursery Leader, CTR leader, Stake Young Women’s secretary, Stake Dance Directors, and a visiting teacher. She was preceded in death by her husband, parents, and seven siblings. She is survived by her three children, H. Nolan (Bonnie) Phillips, Aralee (Roger) Sparks, and Elizabeth “Liz” (Don) Lowe. She has 10 grandchildren, 37 great grandchildren, and one great-great granddaughter. She has had 12 descendants who have served full time missions, two serve as Stake Presidents and six as bishops or bishopric members. Fourteen descendants are Eagle Scouts. Funeral services will be held in the Montpelier Stake Center at 1 p.m. on Friday, August 17, 2018. Viewings will be on Thursday August 16 from 6 to 8 p.m. at Schwab-Matthews Mortuary and from 11:30 a.m. to 12:45 p.m. at the Stake Center prior to services.